In 1934, the Austrian Army (Bundesheer) needed a new heavy armored car for police duties, under the designation “M35 Mittlere Panzerwagen”. Steyr had already developed a vehicle tailored for urban operations, with sloped armor and symmetric body helping the vehicle to maneuver quickly and retreat without having to turn around. The prototype was successfully tested and accepted into service in 1935. Production spanned until 1937 with 27 vehicles being given to the army and the police. All were captured by the Germans and pressed into service after the Anschluss. In “ADGZ”, AD stands for “Austro-Daimler”, the official designation was “M35 Mittlere Panzerwagen”. The ADGZ was a massive, twelve-wheeled armored car, the two external axles with their independent leaf spring suspension, and the central twin axle, with double wheels (eight in all), mated on a common suspension. It was intended for maneuvering off-road, but also for urban usage. The sloped armored body, uniformly 6 mm (0.23 in) thick (except the top and bottom) was welded and almost entirely symmetrical, with the engine at the rear, and two drivers whom could operate the vehicle from each side, switching almost immediately thanks to the dual transmission. There was a central circular turret with a double hatch on top, which could be fully opened to dominate the crowd, housing a 20 mm (0.79 in) KwK 35 L/45 autocannon. Four half-doors punctuated the sides, with the upper and lower parts opening independently. The drivers each had a small sight opening on their side, with an armored hatch and on the other side a ball mount, from which they could operate a single MG 34 machine-gun. So each end presented a driver and machine-gunner. Four headlights were also fitted, two on each end of the vehicle, mounted on the body-integrated mudguards. 27 (28 from other sources) Steyr ADGZs were delivered and 12 used by the Austrian Army in March 1938 in the fast division; 14 were part of the Gendarmerie. The prototype was the 27th. After the Anschluss in 1938, all these vehicles were distributed among SS units and military police. In 1939, a detachment took part in the operations in Danzig, Poland, at the opening of the war. 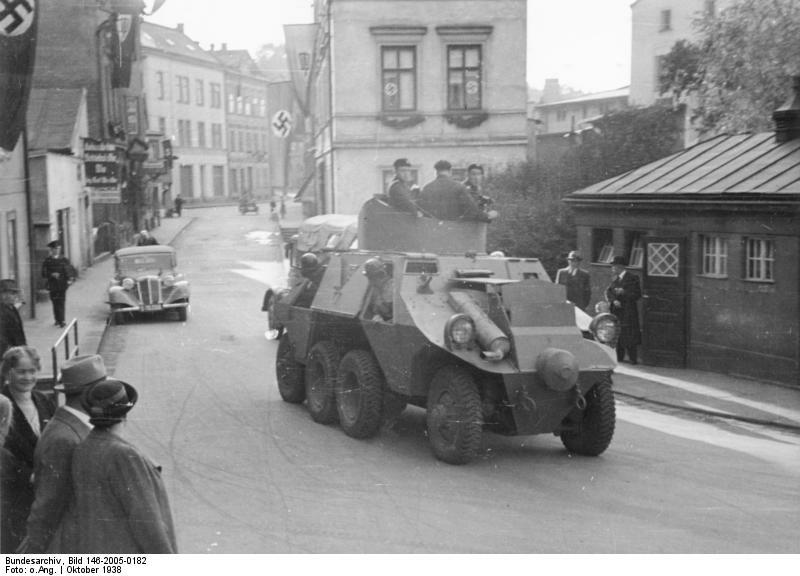 Three SS Heimwehr Danzig armored cars were engaged and one lost in action while taking the post office. In 1941, 25 additional vehicles were ordered by the SS and used in various units in the Balkans, for police operation and fighting partisans (like the “Prinz Eugen” division). An unconfirmed source stated that tests were performed with T-26 turrets after capturing many in 1941. 7th SS Freiwillingen Gerbirgs Division “Prinz Eugen”, Croatia, 1943. ADGZ in the Sudetenland, October 1938 – Credits: Bundesarchiv. 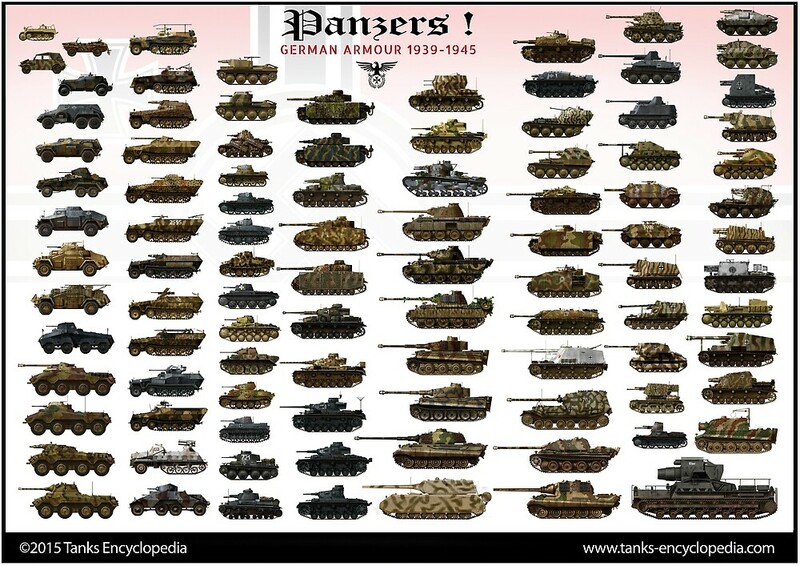 Minor error in the stats for ADGZ, the armour is shown as 0.8 of an inch or 11mm. I think that the 11mm figure could be correct. 0.8 of an inch is a little greater than 20mm. Thank you for the notification Basil, you are indeed right. We have rechecked our sources and corrected the invalid conversion.